Ghost Pump is Here, and it's VICIOUS. 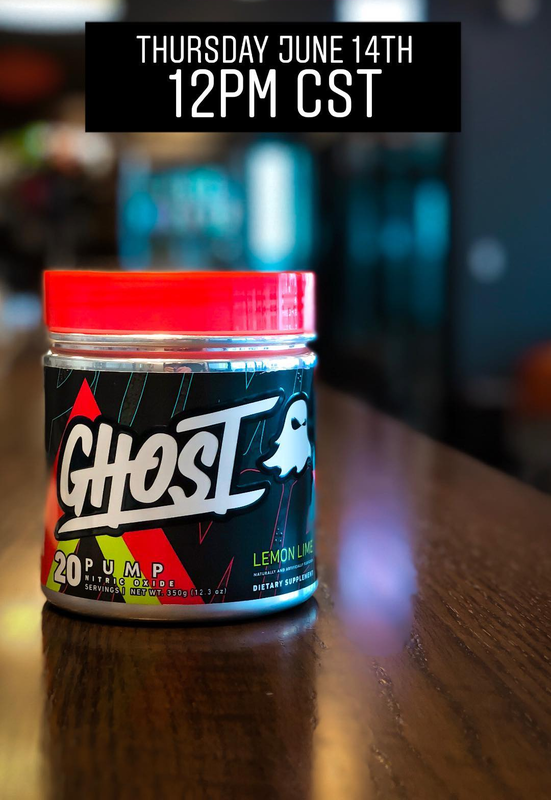 June 1, 2018 marks the second birthday for Ghost Lifestyle and as a present Ghost is giving us its latest innovation, Ghost Pump, a stimulant-free pre workout supplement with doses so unruly we need to throw down a few warnings! 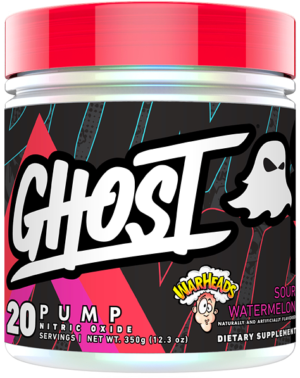 Ghost Pump is finally set to launch, officially-licensed WARHEADS flavor and all! We are don’t need to tell you that Ghost has crushed it so far in 2018. Many factors have led to the company’s success, such as epic new protein flavors, athlete editions of Legend selling out in under two hours, and even its most recent collaboration with Icon Meals for Ghost Protein Popcorn. Now, the company is taking on the growing industry segment in stimulant-free pre workouts. CEO Dan Lourenco told us that the non-stim pump might be his favorite product category, because it can be stacked with almost anything (see our dosage warning though!) or taken as a standalone product. Originally announced in November 2017, Ghost took the time and trial/error to develop what Dan and Ryan believe to be the new industry leader in the category. With a better formula, fully transparent label, great flavors, and offered at a great price (especially after using our coupon!) with a couple extra scoops per bottle, Ghost Pump is not your average pump product. And did we mention it’s vegan? We get into the details below, but first, check out our PRICEPLOW coupon-powered prices below and sign up for Ghost news alerts so you don’t miss those new flavors! 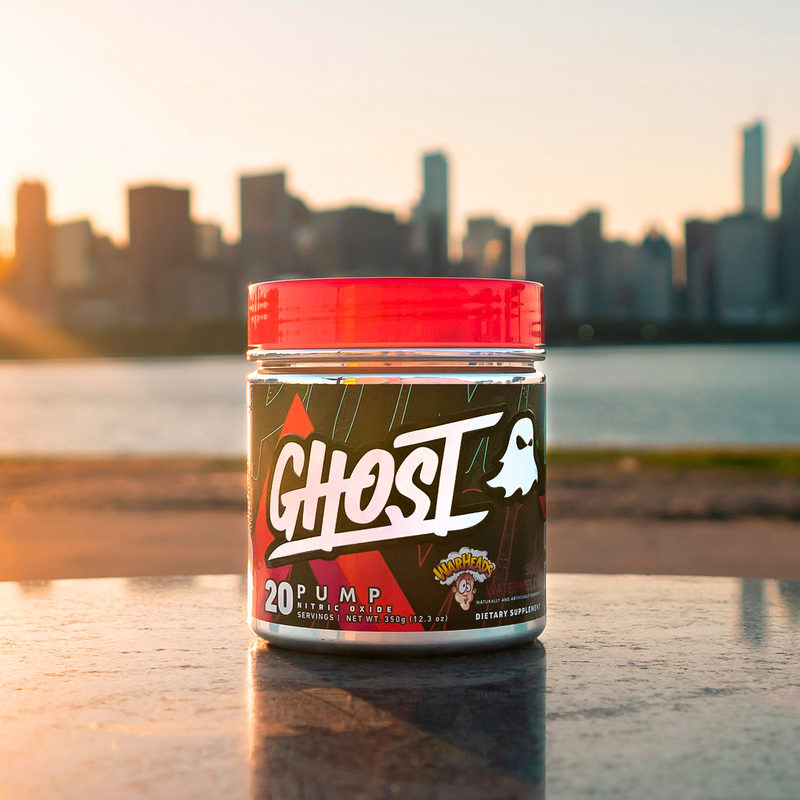 The first thing you will notice from the label is that Ghost Pump is a two-scoop product and has twenty servings. The company does say you can use a single scoop and drag the tub out to forty training sessions, but the recommended serving size is where you’ll get the most effective results. A two-scoop serving comes in at seventeen and a-half grams, making Ghost Pump a fairly hefty-sized serving. Is this the most nitrate we’ve ever seen in one serving? Listed as the first major ingredient, Ghost utilizes a vegan fermented L-Citrulline, which demonstrates Ghost’s commitment to giving vegans a pre-workout they can use. Regardless of whether you or vegan or not, 4000mg of Citrulline is a great start for a pump-focused product! 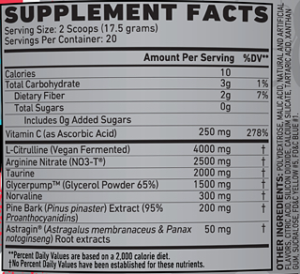 Citrulline drives nitric oxide uptake and that is especially helpful during high-intensity exercise and training. 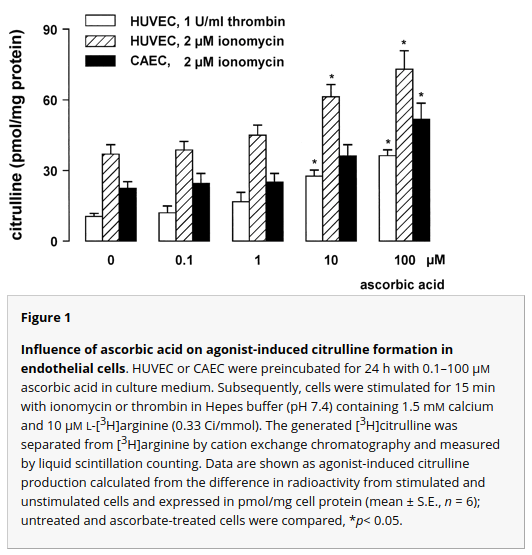 Citrulline operates by converting into L-arginine first, which is actually more effective than taking L-arginine alone. Taking L-arginine alone actually doesn’t work for NO purposes, even if taken in higher doses, so Ghost made sure to give you an above average serving of Cirtulline. WHOA. Just look at that dose. Right when we saw the label, this is the first thing that jumped out, and it immediately told us that Ghost was attacking this category with a vengeance. Seriously, for a moment here, we need to emphasize that this is the max nitrate dose we’ve ever seen, and that you should not combine this with other nitrate-based supplements (or PDE5 inhibitor drugs) or go over the two-scoop max. This is that strong. 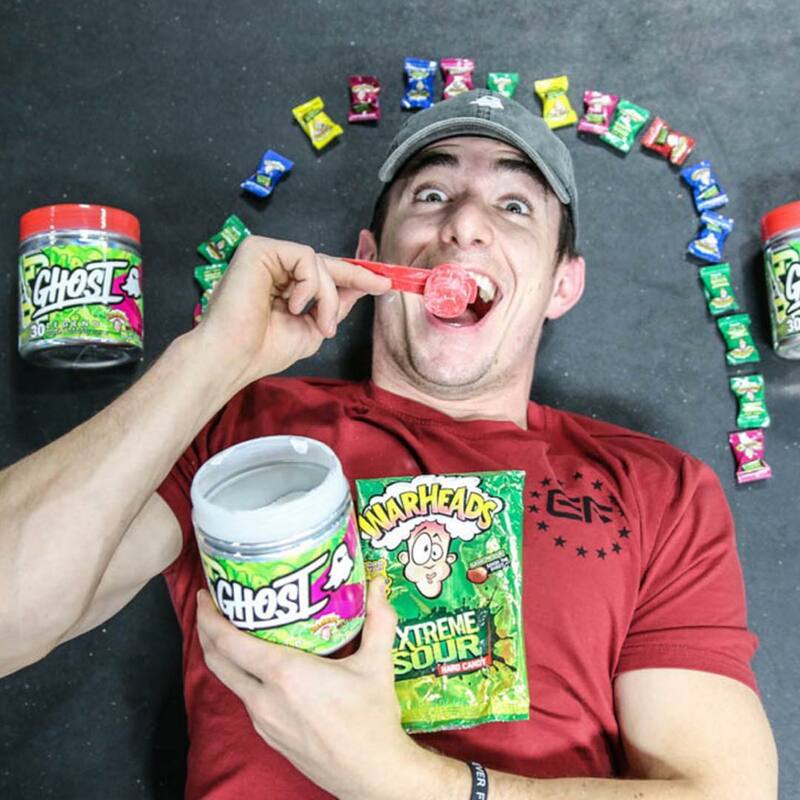 Ghost is the lifestyle supplement brand headed by Dan Lourenco, who’s obviously made a monster splash! Now they’re launching their third new product in 2018 with Ghost Pump! Arginine Nitrate brings a one-two punch that makes it one of the most popular forms of nitrate. Unlike other nitrates, having arginine alongside helps keep nitrate tolerance at bay, making your last scoop of Ghost Size work just as well for you as it did the first time. Nitrates act as vasodilators in the body which also provide cardiovascular benefits by lowering blood pressure,[6,7] opening the flood gates for more blood flow and nutrient delivery. In workout supplements, a nitrate’s primary function is to increase your pumps via said vasodilation, but they can also enhance your endurance by lowering the body’s consumption of oxygen! Add it all together and arginine nitrate will deliver more powerful pumps and more energy during your training. As one of the strongest “pump” ingredients on the market, Ghost Pump already has the looks of a great pump product. But we’re not even close to being done. 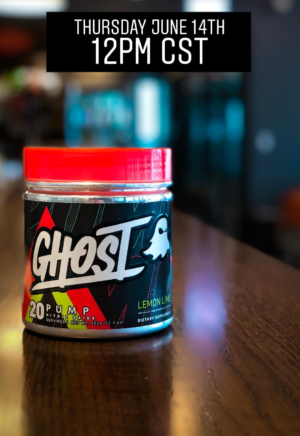 Ghost Legend has 1000mg of Taurine, but Ghost Pump doubles that amount for an above average dose of 2000mg. Arguably, the most common benefits associated with Taurine is the improvement in endurance (even after a single use! ), but there are also improvements to focus and mental performance when using it. Yet Taurine isn’t just limited to those functions in the body, since it acts as an osmolyte to help drive water into the cells of your body, helping wherever it goes. We don’t need to tell you why hydrated cells are beneficial, as you know it furthers endurance and that “cell volumizing pump“. Considering there is no caffeine in Ghost Pump, the improved endurance, focus, and a bit of added mental drive from the extra taurine is never a bad then when you’re stimulant-free. Taurine’s not alone in the “cell hydration water pump” business – our top form of glycerol is here too! When glycerol is consumed orally, as in the case of sports supplements, it is quickly absorbed by the body and ultimately gets metabolized by the kidneys and liver. When taken along with a fair amount of fluid, osmotic pressure is increased within the body to help the body retain that fluid. By default, this leads to the expansion of various fluid spaces inside of the body. Supplement formulators know that former glycerol ingredients were a pain to mix, causing tons of clumping, but GlycerPump is the solution! While past-generation glycerol ingredients can often yield as low as 10%, but GlycerPump was formulated to be a more stable form and has a yield of 65% – and it doesn’t clump like those other forms! Given the above two ingredients, we suggest taking this supplement with a lot of water, and keep hydrating throughout your workout. Everyone talks about the WARHEADS flavor, but don’t sleep on the Lemon Lime! 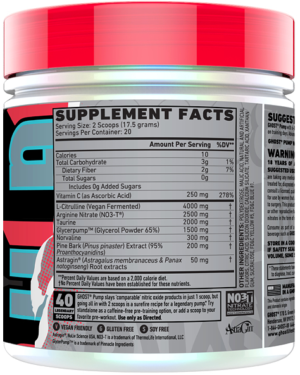 Ghost Pump uses triple the amount of L-Norvaline found in their Legend pre workout. Norvaline is a derivative of Valine and acts as an enzyme inhibitor that prevents Arginine from being degraded in the body. As we touched on a bit ago, if Arginine is present, it will ultimately equate to more nitric oxide. In case you need us to remind you why we want that, it is because it means more pumps! Norvaline and Citrulline have a synergistic effect that we love to talk about with supplements. One is going to boost your arginine levels and the other will keep your body from breaking that arginine down. We’re also of course further helped that we’re also adding arginine from the arginine nitrate, making a triple-whammy NO boost! If you can’t tell, Ghost PUMP is rightfully earning its name with this formula, and we’re not done yet. Vitamin C stirrin up that citrulline! Vitamin C can support elevated NO production in the body and prevent muscle damage to boot – and fact is, if you’re using this supplement, there’s a good chance you’re going to be throwing down some “temporary muscle damage”. Taken with the other pump ingredients in Ghost Pump, it will not only improve your workout and pump, but keep the nitrate in gear and help with recovery when it’s all said and done. All the above is well and good, but the real reason to include Vitamin C alongside nitrates is because Vitamin C prevents nitrate tolerance build-up! Researchers believe that it may be due to a stabilizing effect on enzymes involved in the bioconversion to nitric oxide — so Vitamin C keeps the conversion humming smoothly along yet should be “re-upped” over time. Long story short, this means that your tub of Ghost Pump should be just as strong when you finish it as when you start it, especially because the arginine form of nitrates also prevents tolerance! Another ingredient aimed to aid the pump, now we have a well-dosed super-synergistic compound that covers a user’s pump needs across nearly every pathway! Pine Bark Extract is used to elevate the body’s plasma levels of nitric oxide. In turn, this increases blood flow to muscles. The result of increased blood flow a fresh supply of oxygen and nutrients to your muscles. The beauty of Ghost Pump is that the Pine Bark Extract will work to better deliver the other pumps ingredients into your muscles throughout your training session. This means we can work out longer and harder. With an effective delivery system, you can rest easy knowing that Ghost Pump will make sure your body utilizes and absorbs all of the nutrients and ingredients! AstraGin is a patented combination of Panax Notoginseng and Astragalus Membranaceus from NuLivScience. It serves the purpose of driving the uptake and absorption of amino acids in the body. This can be particularly useful in pre-workouts that contain amino acids, such as Ghost Pump with its 4000mg of Citrulline. 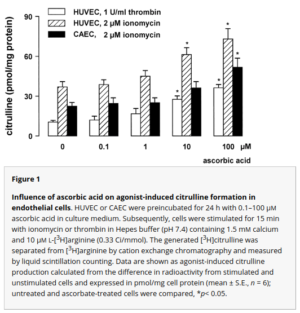 AstraGin is here for the L-Citrulline amplification… but maybe more! These two ingredient together have shown promising results and can stimulate ATP production within the body, boost energy metabolism, and prevent cellular death in the body! It has also shown to strengthen protective effects on cerebral ischemia injury, which results in less brain issues. 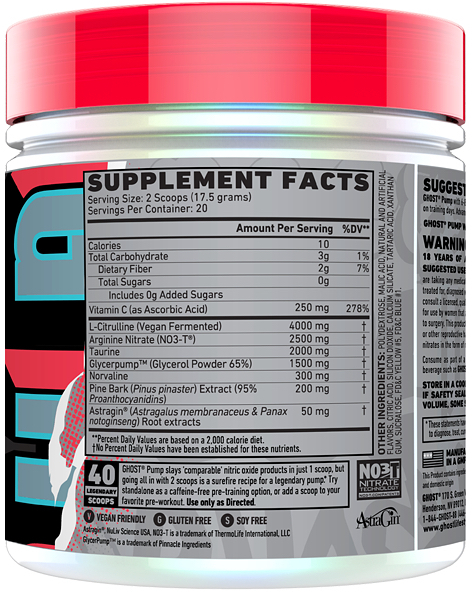 As Dan claims, we can see how this can stack incredibly well with Ghost’s other pre-workouts, as the Astragin contained in Pump will increase uptake of the amino acids in Legend as well. Add it all together and the Astragin is a nice bonus to an already strong product. With benefits like increased amino acid absorption, more ATP production, faster metabolism, and possible brain benefits, what’s not to love? Another quick look at the label shows a few carbs from polydextrose, a fiber we find underrated. This is likely coming from the polydextrose fiber that’s listed in the “Other Ingredients” part of the panel, and maybe a half of a carb from the GlycerPump (whose glycerol is really more of a sugar alcohol). 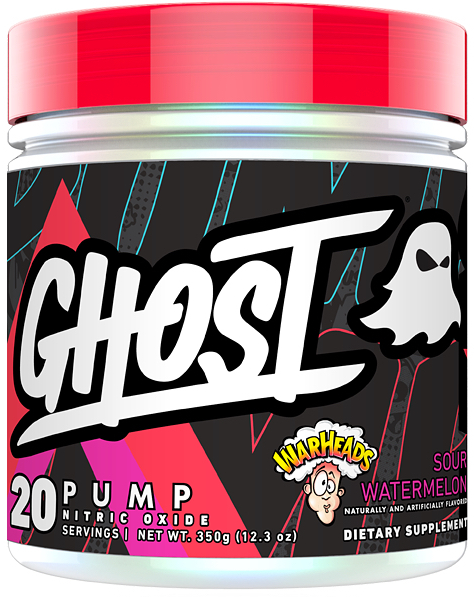 Keeping pace with Ghost Legend and Ghost Size, Pump will have WARHEADS inspired flavors! For those who have tasted Ghost’s products, you know the taste is on point. Hell, it has to be — otherwise WARHEADS wouldn’t have let them license their good candy name! Drinking Ghost Legend is crazy enjoyable (especially the Guzman version of Legend! ), but with no stimulants to compete with, we’re expecting Pump here to be even better! Ghost appears to be exploring additional company collaborations for new creative twists on its products, so sign up for our Ghost news alerts to learn about future flavor developments. As you can see above, not as much as you would think! While Ghost Pump launched at $37.99, if you use our PRICEPLOW coupon below, it will drop down below $30! Considering this has the making of a #1 rated pump supplement, we see the price as being insanely fair… but time will tell with our upcoming review! Remember, if you end up using only a single scoop to stack with your Legend or other pre-workouts, then you will extend the life and get a solid forty servings out of Pump. If you’re on a budget, you can likely get away with a heaping scoop and still love the hell out of this product. We’ve been beyond impressed with what Ghost has accomplished over the past two years. Not often does a company reach such high levels of success in such a short time. 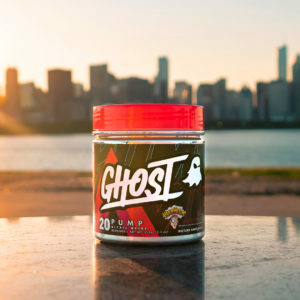 Ghost products are fun, with an edgy twist on the standard supplements you see on shelves everywhere. But it’s not all label dressing – these formulas are fantastic – and Ghost Pump keeps that trend going. 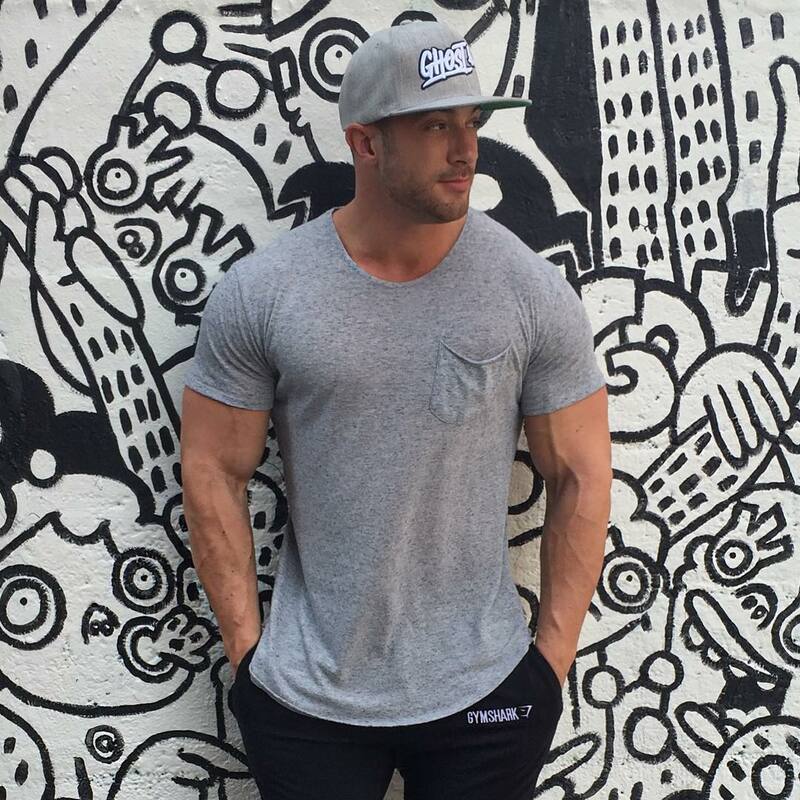 Meet the Chief Ghost, Dan Lourenco, who says that “pump” products are his favorite category of supplements and wanted to create the best pump product ever! So not only do Ghost products look and taste second to none, the products are efficaciously dosed and do what they claim to. Arguably the single most important factor for supporting Ghost is that the company is fully transparent on its labels (and even in its business). We believe that Ghost is one of the few companies out there who are doing things the right way – from formulas to marketing to sales channel. Knowing the company has a diverse following, it even considers the vegan lifestyle and has created products that everyone can enjoy. Dan Lourenco and Ryan Hughes are on a mission to bring quality and transparent formulas to the market that perform at the top of their class and pack world-class taste. The owners and executives at Ghost have a simple approach to their products: they proudly claim that they only hit home-runs. 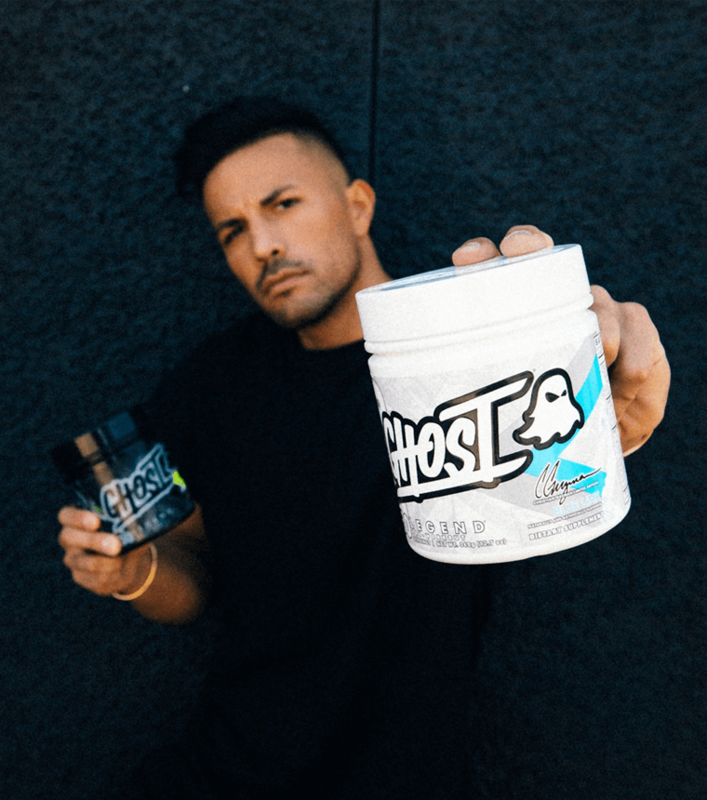 Where many other new supplement companies turn out endless products, Ghost has maintained a smaller product line with higher integrity. Don’t be fooled though. The company may have fewer product offerings than other big name guys, but Ghost has big plans to continue delivering new and industry-shattering and innovative products. We can’t wait to get our hands on Ghost Pump and hope the claims live up to the hype, but looking at this label, it’s hard to believe it won’t do that. Don’t forget to use PricePlow to save big with our PRICEPLOW coupon! 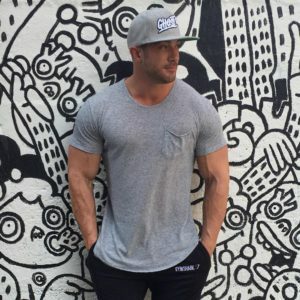 Comments | Posted in New Products, Supplement News | Tagged Arginine, Arginine Nitrate, AstraGin, Christian Guzman, Dan Lourenco, Ghost Supplements, GlycerPump, L-Citrulline, L-Norvaline, Maxx Chewning, NO3-T, Pine Bark Extract, Pinnacle Ingredients, Pre Workout, Pre Workout Supplements, Stimulant-Free Pre Workout Supplements, Taurine, Vegan.